Finding a balance between security and usability is difficult. 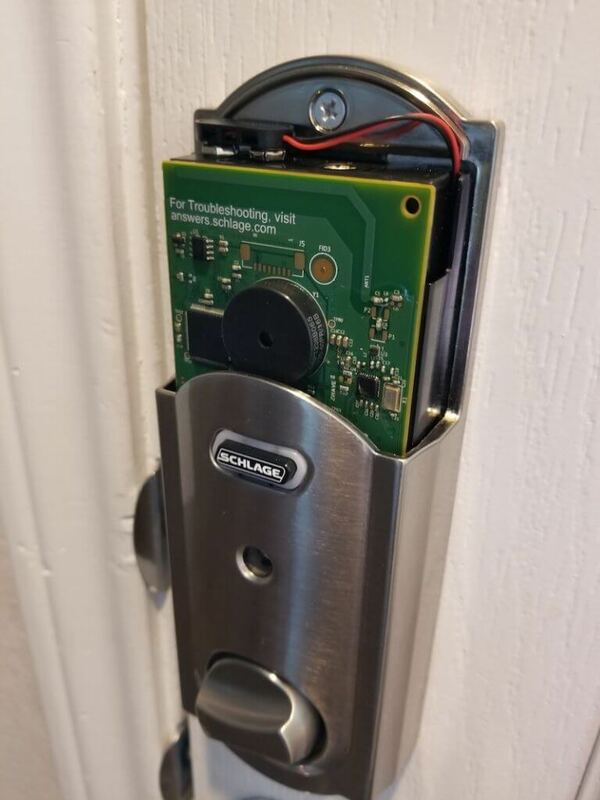 The Schlage Connect is a great balance between the two and probably the best smart door lock out there. We bought the Schlage Connect for ourselves to see if it’s as good as people say. In this Schlage Connect review, we are going to take an in-depth dive into using the lock and its features. We will also answer questions about geofencing and notifications. 1.6 Overall – Is Schlage Connect Worth It? Schlage has been around a long time (since 1920) so they know what they are doing when it comes to locks. The Schlage Connect comes in two styles: Camelot and Century. There are also different colors: nickel, chrome, brass, bronze, and black. Matching your existing hardware shouldn’t be an issue. When buying a smart lock to review, there were a lot of reasons I decided to go with a Schlage Connect review. There is a fingerprint-resistant touchpad that lights up. You can manually open the door with a provided key, or hide the key somewhere on your porch to use it as a backup if batteries run out. On the inside of the door, the lock has a thumbturn for easy, traditional locking and unlocking. As far as smart home specs, it’s compatible with Z-Wave, making the already great stand-alone door lock even better. Setting up the lock for my Schlage Connect review was fairly simple and you should only need a Phillips screwdriver. If your current bolt lock opens and closes easily then it shouldn’t be a problem. If you have to jiggle the door to lock it, then you might need to make some door adjustments or hire a contractor. The lock uses 4 AA batteries and so far after using the lock for a few months, the batteries have hardly gone down at all. We will cover checking the battery levels later in this review. 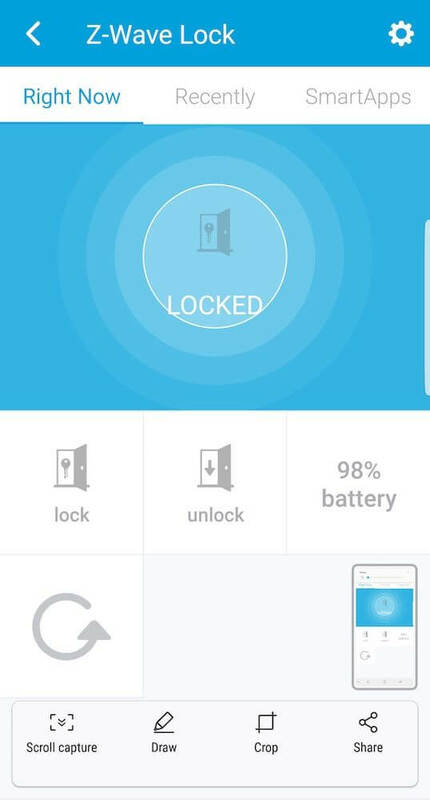 Since some door setups make it difficult lock and unlock the door, Schlage Connect can activate a high energy mode to fully open and close the lock. This will obviously drain the batteries faster so make sure the lock has plenty of room to open and close. 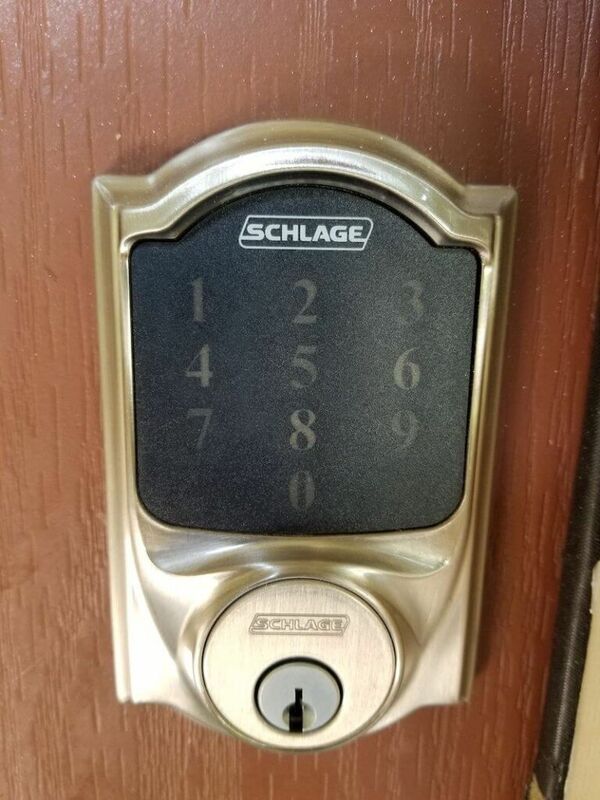 One thing that surprised me is that the Schlage Connect doesn’t have an app from Schlage. Instead, you can use its Z-Wave compatibility to connect to a Z-Wave hub like Wink or SmartThings. At first, this seemed like a bit of a downside in my Schlage Connect review—a smart home gadget without an app? But since I already owned the SmartThings hub, it wasn’t too bad. The instructions in the User’s Guide are very thorough to setup user codes and enable Z-Wave. You are provided a 6 digit code that is entered in every time you want to change a feature. This code is on the inside of your lock or a sticker on the back of the User’s Guide. I got confused with another install guide that it came with, so it took me a while to realize I was looking at the guide that didn’t have the sticker. Z-Wave is disabled by default to save battery life. 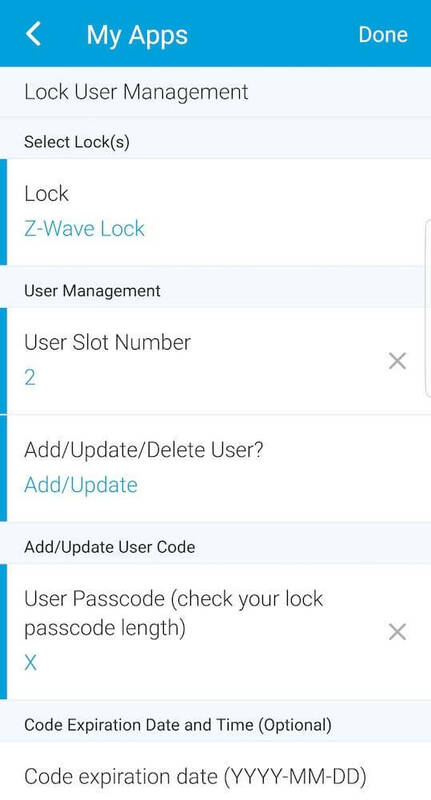 To enable Z-Wave, type the 6 digit code and then 0. The checkmark will appear to let you know that Z-Wave was enabled. 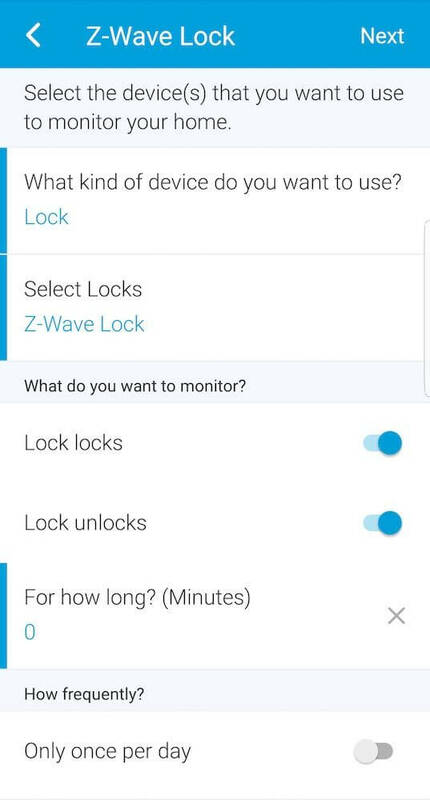 Once that was done, I went over to my SmartThings app and clicked on Add a Thing and it recognized the lock right away. From the SmartThings app, you can open and lock the door remotely and see the battery percentage. You can also see the activity of when the door was opened and closed under the tab Recently. This will show if the lock was manually opened/locked or which code was used. 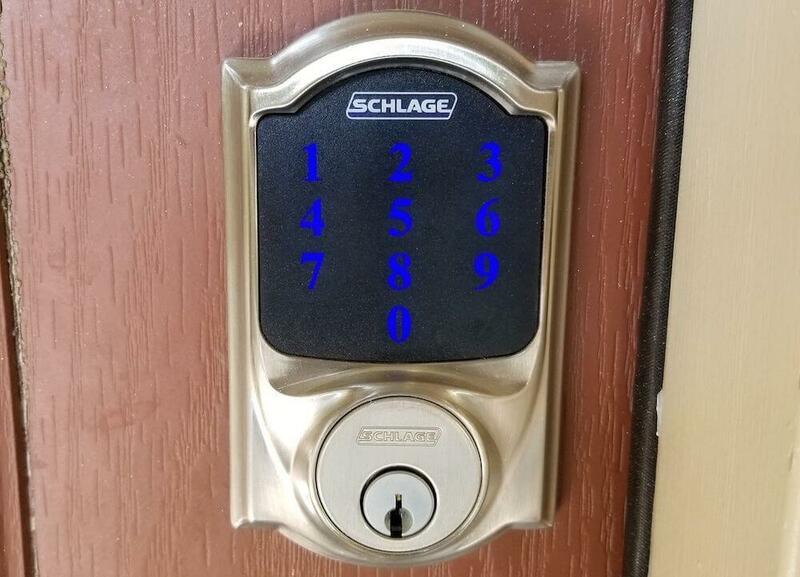 The Schlage Connect allows you to program up to 30 different codes. To enter in codes, just type the 6 digit code and press 1. This will enter the code entering mode. Enter in a 4 to 8 digit code twice to set it. The check mark will blink twice to indicate it was successful and then you can enter in another code. To delete codes, repeat the same process except press 2 instead of 1. To remotely add and remove codes, you will need a Z-Wave hub. Wink will natively allow you to add and delete codes, but SmartThings requires a little extra work. With SmartThings you will need to install a SmartApp that will give you this capability. It might sound complicated, but in my Schlage Connect review it was actually quite easy following the steps below. While it’s annoying that a hub is necessary for this feature, I think it’s worth it since I can totally see myself making door codes for dog walkers and family members while out of town. To control the codes from your SmartThings app, here are the steps you need to take. First, log into SmartThings developer and click on My SmartApps. Then go to this SmartThings community app. Scroll down until you see the code and then copy it. Go back to your SmartThings dashboard and click New SmartApp in the top left. Click on the tab From Code and paste the code you just copied. Publish the app to yourself and now you will see the app in your SmartThings app on your phone. To view the SmartApp on your phone, click on Marketplace in the bottom right, SmartApps tab at the top, and scroll down till you see My Apps. Again, this was very easy and didn’t cause me any headaches when I followed the steps above. One perk of SmartThings is that you can have the code expire at a certain time, unlike Wink. To see more SmartApps related to locks, check out the SmartThings community. When you go out of town and have someone coming over to watch your pet, it’s nice to us notifications to know when they are coming and going. With the Wink hub, this is built in automatically and you can just configure it from the app. For SmartThings, you need to enable notifications on the dashboard in the app. Click on Smart Home Monitor. Then click on the top right cog or settings button. Next click on Custom and New monitoring rule. Select Lock and then select the Schlage Connect lock. You can also be notified when the door is opened or closed by enabling a beep on the Schlage Connect’s built-in alarm. The alarm has to be set to Activity mode, which we will cover in the next section. The built-in alarm is a really nice feature that surprised me during my Schlage Connect review. The lock has a speaker which can sound an alarm when it’s being picked or if the door is forced open. The alarm is defaulted to off, but it can be easily turned on by holding down the Schlage button on the inside part of your door for 5 seconds. Hold it down for 6 seconds to disarm. There are 3 modes and 5 levels of sensitivity. The first mode is Activity, which will beep every time the door is opened and closed. This is good for knowing if your kids or grandkids ran out the door. The second mode is Tamper, and this will trigger the alarm if the lock is fiddled with while it’s locked. Then there is Forced Entry, which will sound the alarm if the door is pushed on with a lot of force. I tested the alarm in my video above and it’s loud, with 90 dB that will frighten or scare off most intruders. Each mode can have the sensitivity changed from 1 being the most sensitive to 5 being the least. If the alarm is going off, just hold down the inside Schlage button until the alarm stops. The Schlage Connect has the highest possible security rating with ANSI/BHMA Grade 1. The build quality on the lock is extremely good and this will definitely boost the security in your home. There are a couple of ways to easily lock the door with little to no effort. First: by just pressing on the Schlage button on the outside of the door will lock the door. This feature is called Lock and Leave. It can be turned on and off by entering the 6 digit code and pressing 7. The other way to have the door lock is to have it automatically lock after 30 seconds. This feature is turned off by default, but after the 6 digit code and 9, this feature can be turned on. People usually love this feature or hate it. If you forget to lock your door, then you will probably like it. But if you are having a party and lots of people are coming in and out, you would want to disable it. In my Schlage Connect review, I found that are also everyday situations where it can be annoying, like if your babysitter heads out to check on something, has the door lock behind them, and is locked out. Schlage Connect doesn’t have built-in geofencing, but you can have your door unlock for you when it recognizes that you arrived home using SmartThings. Wink does not allow this feature due to security concerns. To enable on SmartThings, you must install a custom SmartApp as discussed previously. Overall – Is Schlage Connect Worth It? We have been using this lock for a few months to fully test it for our Schlage Connect review and we’ve found that it’s improved our quality of life. It has worked very reliably and has been much more convenient to use that we would have imagined. We had our kitchen remodeled while we were out of town, and it was nice to give the contractors a door code, see the exact times that they came and went, and feel reassured that the door was secured at night. Even if it wasn’t, I could have easily locked the door while on vacation using the app. Beyond vacations, I use the lock constantly when going on a run and needing to lock the door behind me. The need for a Z-Wave hub might be a downside for some. However, if you are planning on getting more smart devices around your home, then you will find a hub very useful. It’s difficult to expand a smart home without a hub at the center, and Wink/SmartThings are some Check out our Wink 2 vs SmartThings review for more info on Z-Wave hubs. If you don’t want to use Z-Wave and have Apple HomeKit devices, then check out our review of the Schlage Sense vs Connect. We also have a table comparing Smart Locks. We hope that you found this Schlage Connect review helpful and if you have any questions please let us know in the comments below. after 20 minutes of searching for the auto-lock feature, your blog was the place where I found the info. it wasn’t anywhere in the manual. thanks! 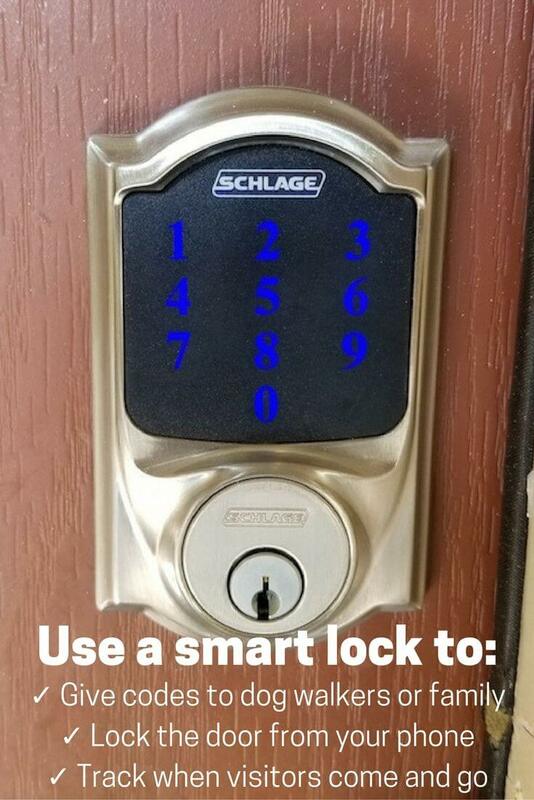 I installed a Schlage connect smartlock recently. I want to give acces to a cleaning person 2 days a week, and at certain hours. Is there a special app for that? 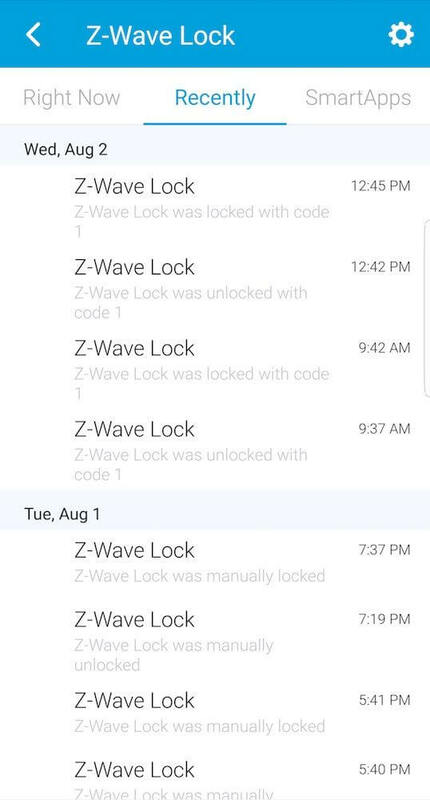 The person was given a code , and uses it to open the door to come to work 2 days of the week. My fear would be at other hours/days, I would like to disable this code. Then on the next time she comes , the code would be enabled for a certain number of hours.